Dublin Airport (Irish: Aerfort Bhaile Átha Cliath) (IATA: DUB, ICAO: EIDW) is an international airport serving Dublin, the capital city of Ireland. It is operated by DAA (formerly Dublin Airport Authority). 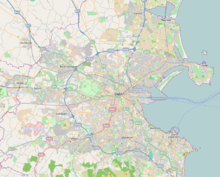 The airport is located 10 km (6.2 miles) north of Dublin in Collinstown, Fingal. In 2018, over 31.5 million passengers passed through the airport, making it the airport's busiest year on record. It is the 13th busiest airport in Europe, and is also the busiest of the Republic of Ireland's airports by total passenger traffic. It has the greatest traffic levels on the island of Ireland, followed by Belfast International Airport. The airport has an extensive short and medium haul network, served by an array of carriers, as well as a significant long-haul network focused on North America, the Middle East and East Asia. It serves as the headquarters of Ireland's flag carrier – Aer Lingus, regional airline Stobart Air, Europe's largest low-cost carrier – Ryanair, and ASL Airlines Ireland, together with another two airlines, CityJet and Norwegian Air International. United States border preclearance services are available at the airport for U.S.-bound passengers. Shannon Airport is the only other airport in Europe to offer this facility. In 1917, during World War I, the townland of Collinstown was selected as the site of a base for the British Royal Flying Corps. By April 1918, when the Flying Corps was renamed the Royal Air Force, Collinstown Aerodrome was more than 20% complete. Construction was completed in 1919 when the Irish War of Independence broke out. On 20 March 1919 a group of 30 Irish Volunteers, including five employed by the RAF, stole 75 rifles and 5,000 rounds of ammunition from the base. As Collinstown Camp the site was used for internment of Irish republicans. At the end of 1922 the land and buildings at Collinstown were transferred to the Irish Free State. The airfield quickly fell into disrepair and grass grew on the former runways. In 1936 the Executive Council of the Irish Free State established a new civil airline, Aer Lingus, which began operating from the military aerodrome, Casement Aerodrome, at Baldonnel to the southwest of Dublin. A decision was made that a civil airport should replace Baldonnel as Dublin's airport. The former Collinstown site, extended into the neighbouring townlands of Rock and Corballis, was chosen. Work on the new airport began in 1937. By the end of 1939, a grass airfield surface, internal roads, car parks and electrical power and lighting were set up. The inaugural flight from Dublin took place on 19 January 1940 to Liverpool. In August 1938, work began on a new airport terminal building. The terminal building was designed by architect Desmond FitzGerald, brother of politician Garret FitzGerald. FitzGerald, who had designed an airport terminal as part of his college studies, led a team of architects that also included Kevin Barry, Daithí Hanley, Charles Aliaga Kelly, Dermot O'Toole and Harry Robson. The terminal building opened in early 1941, with its design heavily influenced by the tiered structure of the luxury ocean liners of the time. The terminal was awarded the Triennial Gold Medal of the Royal Hibernian Institute of Architects in 1942 and is today a listed building. An Aer Lingus DC-3 plane at Dublin Airport's original Terminal 1 in May 1950. Due to World War II, which was known as The Emergency in the Irish Free State, services were severely restricted at Dublin Airport until late 1945. The only international scheduled routes operated during this time were by Aer Lingus to Liverpool (and for a period to Manchester's Barton Aerodrome). The end of the war meant the beginning of a major expansion in services at the airport. Aer Lingus resumed its London service to Croydon in November 1945. In 1947, KLM started the first European flights to Dublin with a service to Amsterdam. Three new concrete runways were completed in 1948, and in 1950 - after ten years in operation - the airport had welcomed a total of 920,000 passengers. Throughout the 1950s Dublin Airport expanded with virtually uninterrupted traffic growth. Runway extensions and terminal enhancements were carried out to deal with the influx of traffic and passengers. New airlines began serving the airport also. These included British European Airways, Sabena, and BKS. In 1958, a new transatlantic service was started by Aer Lingus via Shannon Airport. By the mid 1950s, it was clear that the original terminal building was too small to cope with growing passenger numbers. A new North Terminal was opened in June 1959. Originally, the plan was that North Terminal would handle all US and European flights, but instead it became the arrivals terminal for all Dublin Airport passengers, while the original passenger terminal was used for departures. During the 1960s, the number of scheduled carriers continued to grow. By the close of the 1960s, a sizeable number of Boeing 737s, BAC One-Elevens, Boeing 707s and Hawker Siddeley Tridents were using the airport regularly. To cope with larger aircraft in the late 1960s new departure gate piers were added close to the old terminal to cope with larger aircraft. These piers would subsequently be connected to Terminal 1. During 1969, the airport handled 1,737,151 passengers. The advent of wide-body aircraft posed opportunities and challenges for aviation. In 1971, Aer Lingus took delivery of two new Boeing 747 aircraft; the first one arrived in March and, shortly afterwards, performed a flyover above O'Connell Street in Dublin on Saint Patrick's Day; a third Boeing 747 was delivered later that decade. To cope with this, a new £10 million passenger terminal capable of handling six million passengers per year, which became known as Terminal 1, was opened in June 1972. The growth which was anticipated at Dublin's airport (and provided for through heavy investment by the airport and Aer Lingus) during the 1970s did not materialise immediately. In 1983 Aer Lingus opened its 'Aer Lingus Commuter' division which took delivery of Shorts, Saab AB and Fokker turboprop aircraft to open regular daily domestic services to and from Ireland's smaller regional airports for the first time, as well as to serve existing routes to smaller regional airports in the United Kingdom. At various stages of its operations, flights were operated to several Irish regional airports to feed passengers into Aer Lingus's international network. These domestic destinations included Cork Airport, Shannon Airport, Kerry Airport, Galway Airport, Ireland West Airport Knock, Waterford Airport, Sligo Airport and City of Derry Airport. Aer Lingus Commuter has since been re-absorbed into the main company. The domestic routes, with the exception of Dublin-Shannon, were taken over by Aer Arann. Most of these routes have since been discontinued as the development of the motorway network in Ireland has resulted in significant reductions in travelling time by road. Aer Lingus has continued with the remaining Dublin–UK flights. During the 1980s, major competition, especially on the Dublin–London routes, resulted in passenger numbers swelling to 5.1 million in 1989. In the same year a new 8,650 ft (2,640 m) runway and a state-of-the-art air traffic control centre were opened. Dublin Airport continued to expand rapidly in the 1990s. Pier A, which had been the first extension to the old terminal building, was significantly extended. A new Pier C, complete with air bridges, was built and as soon as this was completed, work commenced to extend it to double its capacity. The ground floor of the original terminal building was returned to passenger service after many years to provide additional departure gates. Pier D, completed in October 2007, is a dedicated low-fares boarding area and provides 14 quick turn-around stands and departure gates; these are not served by air bridges. In 1993, a major milestone for the airport was the signing of a new United States – Ireland bilateral agreement which allowed airlines to operate some direct transatlantic services for the first time to/from Dublin Airport instead of touching down en route at Shannon Airport on the west coast of Ireland. (Shannon had once been a major transatlantic refuelling stop for pre-jet aircraft, and this agreement was designed to protect the interests of the Shannon region when modern jets no longer required a refuelling stop and Shannon saw a fall-off in traffic.) Airlines still had to provide an equal number of flights either to or through Shannon as to Dublin. A gradual further watering down of Shannon's so-called 'stopover' status came into effect in November 2006 when more direct flights to Dublin were allowed. The stopover requirement disappeared completely in 2008. At that time, airlines were allowed to fly direct to the US from Dublin without having to match these with any to/from Shannon. It was expected that this would result in a huge increase in services between Dublin and the US and Aer Lingus has identified 16 destinations that it would like to serve directly from Dublin. With the success of Ireland's 'Celtic Tiger' economy, Dublin Airport saw growth in the 1990s and 2000s. This demand was driven by an increased demand for business travel to and from the country, together with an increase in inward tourism and a surge in demand for foreign holidays and city breaks from the Irish. The demand from Ireland's migrant workers, principally those from Eastern Europe, has resulted in a large number of new routes opening to destinations in the European Union accession states. Ireland was one of only three European Union countries (as well as the United Kingdom and Sweden) to open its borders freely to workers from the ten accession states that joined the European Union in 2004. The airport saw significant declines in traffic in 2009 and 2010, although since 2011 the airport has seen an increase in traffic. During 2012, this increase continued with passenger numbers growing by 1.9%. During 2013, passenger numbers at Dublin Airport were above the 20 million mark for the first time since 2009 with a 5.6% increase year on year. During 2014, this positive trend continued with an 8% increase over 2013. As of early December 2015, passenger figures have increased by 16% compared to 2014, and the previous record of 23.46 million passengers set in 2008 has already been passed. 22 intercontinental routes to North America, Africa and the Middle East operate from Dublin Airport. In 2007, Etihad Airways opened a flight between Dublin Airport and Abu Dhabi with 14 flights weekly in operation, with some interruptions, since March 2010. In addition, Emirates have operated a direct connection to Dubai since January 2012. In total, there are 17 destinations in North America connected directly to Dublin Airport by Aer Lingus, Air Canada, Air Canada Rouge, American Airlines, Delta, United Airlines, Norwegian and Ethiopian Airlines. WestJet and Air Transat also operate seasonal routes to the Canadian cities of Montréal, Toronto and St. John's. In 2015 Ethiopian Airlines opened the first direct link between Dublin and Africa, excluding holiday services to Morocco, Tunisia and Egypt. Since June 2018, Hong Kong's flag carrier Cathay Pacific have had 4 weekly direct flights from Dublin to Hong Kong, making it Ireland's first ever direct link to the Far East. In the mid twentieth century, the Irish government introduced a rule stating that all air traffic between Ireland and the United States must transit through Shannon Airport. In return, the United States government placed a limit of four airports in the US that Aer Lingus could operate to. On 22 March 2007, the Open skies agreement between the US and EU was ratified. This resulted in the immediate cancellation of the long-running 'Shannon Stopover' requirement, whereby the Irish government had insisted that 50% of all transatlantic flights between Ireland and the United States must pass through Shannon Airport. Dublin Airport is one of only two airports in Europe with United States border preclearance services for US-bound passengers (the other being Shannon Airport). It allows passengers to have their paperwork dealt with before departure saving time upon arrival in the United States. In October 2004, Aer Rianta (which is the Irish for 'Air Ways' or 'Air Tracks') was renamed Dublin Airport Authority plc, a result of the State Airports Act 2004. All assets and liabilities previously owned by Aer Rianta were transferred to Dublin Airport Authority. The State Airports Act 2004 also established new airport authorities at Shannon and Cork Airports. The Shannon Airport Authority and the Cork Airport Authority had separate boards of directors and were authorised under the Act to prepare business plans, which may have in time lead to their full separation from the Dublin Airport Authority. Following a decision by the Irish Government, Shannon Airport became a separate publicly owned airport on 31 December 2012. In July 2013, the Dublin Airport Authority was officially renamed "DAA plc" by the Irish Government. The rename was principally to remove the "Dublin" and "Authority" elements of the name which were seen to have little relevance to the overall functions of DAA. The name change announced in July 2013 took effect on 6 November 2014. As the largest gateway to Ireland, over 25 million passengers travelled through the airport in 2015, a 15% increase over the previous year. The main contributors to the growth in traffic in 2015 were the 23 new routes launched during the year and extra capacity on 40 existing services. Both long-haul and short-haul traffic increased by 15% in 2015. A record 8.9 million people travelled between Dublin Airport and Britain during 2015, which was a 14% increase on the previous year. Dublin Airport also welcomes more than one million passengers per annum from Northern Ireland and is a key international gateway for overseas visitors to Northern Ireland., whose largest airport is less than a quarter the size of Dublin in terms of passenger numbers. The current Terminal 1 building opened in 1972 was designed to handle five million passengers per year. The original design included a second pier which would have been identical to the current decagon-shaped boarding Pier B, but this was never built. A car park was originally located on the upper floor of the building and the access ramps are still in place but it was closed for security reasons in the 1970s and converted into offices. Terminal 1 has been regularly extended and improved over the last two decades. In October 2007, a new pier designed by Larry Oltmanns, while design director of the London office of Skidmore, Owings & Merrill, who also designed graphics for its interior, was opened to the north of terminal 1. This pier caters for the majority of Ryanair flights. In 2009, a new extension featuring new food and retail outlets was added to the side of Terminal 1. Terminal 1 is currently home to all airlines except Aer Lingus, American Airlines, Delta Air Lines, Emirates, Norwegian (long-haul services) and United Airlines. Pier C was demolished during the construction of Terminal 2. Terminal 2 is a 75,000 m2 (810,000 sq ft) terminal and pier (Pier E) which provides aircraft parking for 27 narrow body aircraft through 19 departure gates which can handle up to 15 million passengers annually. The project was designed by Pascall+Watson architects and the total cost was €600 million. Aer Lingus is the main carrier operating at terminal 2 and since its opening have developed a hub at Dublin primarily for traffic traveling between Europe and the United States. Terminal 2 is now the transatlantic gateway for flights to the United States as it features a US pre-clearance immigration facility which was previously housed in terminal 1. Construction of Terminal 2 began on 1 October 2007, and it was officially opened on 19 November 2010 by the then Taoiseach Brian Cowen T.D. The intended purpose of terminal 2 was to house all long-haul carriers in addition to Aer Lingus however significant growth in US traffic has resulted in most long haul carriers flying outside the United States remaining in terminal 1. During the design of terminal 2 provisions were made for an expanded check in hall and additional pier (Pier F) to cater for future growth. Currently Aer Lingus, American Airlines, Delta Air Lines, Emirates, Norwegian and United Airlines operate from terminal 2. DAA has its own branch of the Airport Police Service which is mandated to provide aviation and general policing at the airport. The Airport Police Station is centrally located on the Arrivals road between Terminals 1 and 2. The airport also has its own Airport Fire and Rescue Service which provides cover to the entire campus, its roadways and lands. The Office of the Revenue Commissioners provide a customs service to both passenger and cargo terminals, while the Department of Agriculture also has a presence in the airport. Irish Naturalisation and Immigration Service provides an Immigration service for all international passengers arriving at the airport. The Gardaí also have a small sub-station located beside the old terminal. In 2016 it was confirmed that armed Garda Regional Support Units (RSU) would be deployed overtly to patrol Dublin Airport and Dublin Port full-time on foot inside terminal buildings and via vehicles outside and surrounding the perimeter to counter the rising threat of terrorist attacks in Europe. The decision was made as a direct result of the 2016 Brussels bombings in Belgium. Aer Lingus, Ryanair, CityJet, Eirtech and Dublin Aerospace have aircraft maintenance hangars and facilities at Dublin Airport. In 2010 Etihad Airways announced a new maintenance hangar which will handle the Airbus A330-200 which the airline uses on their route from Abu Dhabi to Dublin. In time the airline will allow other airlines to use this facility. Construction is currently under way on a new air traffic control complex and control tower which will replace the existing structure. The new facility has been designed by Scott Tallon Walker architects. A planning application was submitted in August 2009. The new control tower will be 87.7 m (288 ft) in height. The new control tower is necessary because the construction of the future parallel runway will obstruct visibility of certain parts of the airport from the existing control tower. Main Apron seen from the air Pier C (centre, now replaced by Terminal 2) clearly visible with Cargo ramp and Ryanair Maintenance facilities. A new runway measuring 3,110 m (10,203 ft) is currently under construction parallel to the existing runway 10/28, which opened in 1989. Planning permission for the runway was originally granted in August 2007, with 31 planning conditions attached. The new runway will replace runway 11/29 (which is no longer in use as a runway and is now used for aircraft parking) and will be built 1,690 m (5,545 ft) to the north of and parallel to the existing runway 10/28. The new runway will allow the airport to accommodate 30 million passengers per annum once in operation, and it will be 3,110 m (10,203 ft) long. In March 2009 the DAA announced in a proposal for consultation that the new runway may be built to a length of 3,660 m (12,008 ft) following consultation with potential long-haul carriers. A runway of this length would allow direct flights from Dublin to the Far East. The runway was expected to cost in the region of €300 million. In the meantime, the company has invested heavily in extending aprons and creating rapid exit taxiways to derive maximum efficiency from the existing main runway. Runway 11/29, the shortest and one of the oldest runways, is closed to allow overspill aircraft parking. This runway will disappear under the new parallel runway in due course. After a delay of several years due to the global financial crisis and predictions of falling consumer demand, it was announced in April 2016 that the new runway would start construction in 2017 and to be completed by 2020. ^1 Ethiopian Airlines has a fuel stop on its flights from Addis Ababa to Chicago–O’Hare, Toronto–Pearson and Washington–Dulles via Dublin on outbound flights only, due to weight restrictions on departure from ADD. The airline has no rights to transport passengers solely between DUB and IAD, ORD or YYZ and thus does not carry passengers from Dublin on these flights. Passenger numbers at Dublin Airport increased every year during the 10 years between 1998 and 2008, from around 11.6 million to over 23.4 million. Passenger numbers fell however during the subsequent two years to around 18.4 million in 2010, with a small increase to 18.7 million in 2011 and 19.1 million in 2012, then 2013 saw a significant increase of 5.6% to 20.2 million. In 2014, passenger numbers increased by almost 8% to over 21.7 million. Traffic growth of over 15% during 2015 resulted in passenger numbers exceeding 25 million for the first time. The previous record of 23.46 million (set in 2008) was exceeded during the first week of December 2015. Dublin Airport is located just off the M1 and the M50 10 km (6.2 mi) north from the city centre and 2 km (1.2 mi) south of the town of Swords. The airport is approximately 210 kilometres (130 mi) away from both Limerick and Galway and 266 kilometres (165 mi) from Cork. Belfast is around 158 kilometres (98 mi) away. There is no rail link to Dublin city centre, and the public transport options to the city are taxis, buses and private transport. Dublin Airport is served by a large network of bus and coach routes, serving both the wider Dublin area and intercity links to the rest of Ireland. More than 700 buses a day service Dublin Airport. In Dublin city, Dublin Bus is the main provider of transport to and from the airport operating Airlink Express routes 747 and 757 to the city centre terminus of Busáras and the railway stations of Dublin Connolly and Dublin Heuston, as well as to Merrion Square and Camden Street, respectively. In addition, Dublin Bus and Go-Ahead Ireland run local stopping services that serve such residential areas as Santry, Swords, Rathfarnham, Sutton, Malahide, Beaumont, Harold's Cross, Drumcondra, Balbriggan, Skerries, Rush and Portmarnock, with routes 16, 33A, 41, 41B and 102. Aircoach offers a number of coach services from the Airport to the Dublin area, serving both the city centre and surrounding areas including Donnybrook, Leopardstown, Sandyford, Dalkey, Greystones. Bray, Blackrock, Dún Laoghaire Killiney and Sandymount. Dublin Coach links Dundrum and Red Cow Luas to Dublin Airport. At a national level, Expressway offers a large number of routes from Dublin Airport to 18 destinations such as Galway, Wexford, Sligo, Donegal, Drogheda, Navan, Cork, Wicklow and Letterkenny. Bus Éireann and Ulsterbus Goldline jointly offer cross-border bus services, namely X1/X2 to Belfast. Translink solely operate services X3/X4 to Derry via either Monaghan and Omagh, or Armagh and Cookstown respectively. Citylink and Gobus offer services to Galway while Éirebus and JJ Kavanagh operate regular services to Limerick, Kilkenny and Waterford. Wexfordbus connects the airport with Wexford, and John McGinley Coaches also connects the airport with Donegal ending in Annagry. Taxis are available at Taxi Ranks located directly outside of Terminal 1 and Terminal 2. There is no direct rail connection to Dublin Airport. However, Iarnród Éireann (Irish Rail) provide suburban and intercity railway services from Dublin Connolly and Dublin Heuston railway stations, and there are regular bus services from both stations to the airport. Some city bus services serve Drumcondra suburban railway station, which is on the Connolly to Maynooth railway line while the 102 route connects Dublin Airport to Sutton DART station. Bus services to Busáras/Dublin Connolly and Dublin Heuston railway stations connect with the Luas Red Line. For many years, it was expected that Iarnród Éireann would extend the Dublin Area Rapid Transit (DART) to serve the airport. These plans were replaced with a proposal for an underground metro line, which would run from the city centre to Swords via the airport. The route for the line, Metro North, was announced in October 2006 and was proposed to connect with several other modes of transport. In 2011, it was announced that the Metro North plan would be deferred due to a lack of funding. There are also plans for the InterCity to reach the airport. As of March 2018, an updated plan suggested that the Metro line might "be open to the public from 2027" but that the details, line, route and timelines were all "subject to change as the final designs haven't been confirmed". ^ a b c Ó Conghaile, Pól (19 January 2015). "Dublin Airport: Memories take flight as Ireland's gateway celebrates 75 years". Irish Independent. Retrieved 18 January 2016. ^ a b c EIDW – Dublin/International (PDF). AIP and charts from the Irish Aviation Authority. ^ a b "TRAVEL Extra's Sunday supplement: Take-off, the sod on Dublin's new runway is turned". Travel Extra. 17 February 2019. Retrieved 22 March 2019. ^ "Monthly Review". Irish Aviation Authority. December 2018. Retrieved 22 March 2019. ^ "daa – Home". Retrieved 2 June 2015. ^ "Record 2016 For Dublin Airport With Almost 28M Passengers". www.dublinairport.com. Retrieved 10 April 2019. ^ "Air Operator Certificate Holders". Archived from the original on 8 November 2016. Retrieved 7 November 2016. ^ O Snodaigh, Aengus (25 March 1999). "Remembering the Past: Daring arms raid". An Phoblacht. Retrieved 7 February 2018. ^ McGarry, Fearghal (6 November 2015). The Abbey Rebels of 1916: A Lost Revolution. Gill Books. p. 267. ISBN 9780717170739. Retrieved 7 February 2018. ; Malone, Brenda (May 2013). "A Secret Photograph from Rath Internment Camp". Collections & Research / Documentation Discoveries. National Museum of Ireland. Retrieved 7 February 2018. ^ "1937 – Dublin Airport – Architecture of Fingal – Archiseek.com". Archiseek.com. Retrieved 2 June 2015. ^ a b c d "History". www.dublinairport.com. Retrieved 10 April 2019. ^ "Online pre-course Workbook, Version 2, January 2017" (PDF). Aer Lingus. Retrieved 3 October 2018. ^ "Passenger Numbers at Irish Airports - 2002 to 2015". Executive Trust Ltd. Retrieved 13 January 2017. ^ "Dublin Airport Breaks Annual Passenger Numbers Record". Dublin Airport. 4 December 2015. Archived from the original on 13 April 2016. Retrieved 13 January 2017. ^ a b "Dublin Airport Information". CARHIRE.ie. Retrieved 8 April 2015. ^ Mulligan, John (3 June 2015). "Irish airports lose exclusivity on offering US pre-clearance". Irish Independent. Retrieved 30 March 2016. ^ "Dublin Airport Guide.com – Dublin Airport Authority Renamed". Retrieved 2 June 2015. ^ "Press Releases > Name Change Takes Effect At daa". Archived from the original on 23 September 2015. Retrieved 2 June 2015. ^ a b "daa Annual Report 2015". issuu. Retrieved 10 April 2019. ^ "Dublin Airport Grows NI Resident Business By 37% in 2015". www.dublinairport.com. Retrieved 10 April 2019. ^ "Pier D To Open on Sunday". Build.ie, Ireland's Construction Directory. 26 October 2007. Archived from the original on 21 July 2011. Retrieved 27 December 2018. ^ "Airlines Flying From Dublin Airport T2". Dublin Airport T2. Archived from the original on 6 June 2017. Retrieved 1 July 2017. ^ Lally, Conor (23 March 2016). "Gardaí to begin armed policing at Dublin Airport". The Irish Times. Retrieved 24 March 2016. ^ Hancock, Ciarán. "One more thing." Irish Times. Friday 18 June 2010. Retrieved on 13 July 2010. ^ "iaadublincontroltower.ie". Archived from the original on 25 February 2010. ^ Neil Callanan (13 July 2008). "New control tower needed at Dublin Airport as it 'can not see end of new runway'". Tribune.ie. Archived from the original on 10 March 2016. Retrieved 3 February 2011. ^ "You have to be pretty thick to land a Jumbo". The Irish Independent. 21 June 1989. Retrieved 15 December 2013. ^ "Parallel Runway". Dublinairport.com. Archived from the original on 23 July 2010. Retrieved 3 February 2011. ^ "DAA PROPOSED CAPITAL INVESTMENT PROGRAMME 2010 – 2014". Aviationreg.ie. Retrieved 3 February 2011. ^ John Mulligan (7 April 2016). "Dublin Airport to get new €320m runway, supporting 1,200 jobs during construction". Irish Independent. Retrieved 7 April 2016. ^ Dublin Airport Authority (7 April 2016). "DAA To Build New Runway At Dublin Airport". Archived from the original on 10 April 2016. Retrieved 7 April 2016. ^ Ó Conghaile, Pól (28 August 2018). "Aer Lingus announces flights from Dublin to London City Airport". Irish Independent. Retrieved 28 August 2018. ^ "Dublin Airport Welcomes Aer Lingus' Transatlantic Expansion". Dublin Airport. 12 September 2018. Retrieved 12 September 2018. ^ "Silent Night turns 200: Celebrating a classic Christmas carol in Salzburg". www.irishexaminer.com. ^ a b "Visit Santa". visitsanta.ie. ^ "Aeroflot resumes 3 European routes in W18". Routesonline. 16 August 2018. Retrieved 17 August 2018. ^ "Air Arabia DUB-AGA". Air Arabia. Retrieved 5 April 2017. ^ "Au revoir Rouge as Air Canada returns to the Dublin-Toronto route with three-class offering". Travel Extra. Retrieved 30 May 2017. ^ "Air Canada Deepens Embrace of the Emerald Isle with Expanded Non-Stop Services to Ireland from Toronto and Montreal". Air Canada. 13 September 2017. Retrieved 12 September 2018. ^ a b "Air Canada S19 Dublin aircraft changes". Routesonline. 1 November 2018. Retrieved 8 February 2019. ^ a b c "Flight Only". Sunway. Retrieved 8 January 2019. ^ "airBaltic To Operate New Dublin-Riga Service Next Summer". Dublin Airport. 20 December 2018. Retrieved 20 December 2018. ^ a b c d e f g h i j k l m n o p q r s t u "Flight Timetable". tuiholidays.ie. ^ "Cancellations Reductions International additions" (PDF). American Airlines. 21 August 2018. Retrieved 27 October 2018. ^ "Flight Only - Dublin to Dubrovnik". Croatia Tours. Retrieved 3 December 2018. ^ "British Airways Launch New Dublin-Manchester Route". Dublin Airport. 7 December 2017. Retrieved 8 December 2017. ^ "Croatia Airlines resumes Ireland service in S18". Routesonline. 2 February 2018. Retrieved 2 February 2018. ^ "Afgange" (in Danish). Hans Christian Andersen Airport. Retrieved 24 March 2019. ^ "Flight Schedule". FlyOne Airlines. Retrieved 19 December 2017. ^ "Great Dane Airlines outlines scheduled operation from June 2019". Routesonline. 22 March 2019. Retrieved 22 March 2019. ^ "Hainan Airlines Launches New Dublin-Beijing Route". Dublin Airport. 15 March 2018. Retrieved 15 March 2018. ^ "Hainan Airlines launching Shenzhen-Dublin flights in February". Business Traveller. 21 January 2019. Retrieved 21 January 2019. ^ "Flights to Dublin". Icelandair. Retrieved 2 October 2017. ^ "Laudamotion Launches New Dublin To Vienna Winter Service". Dublin Airport. 25 May 2018. Retrieved 25 May 2018. ^ "Laudamotion stockt Winterflugplan auf" [Laudamotion is adding to winter timetable] (in German). aero.de. 16 July 2018. Retrieved 21 July 2018. ^ "Passenger flights return to Carlisle airport after 25 years". BBC News. 4 March 2019. Retrieved 4 March 2019. ^ "Find the cheapest flights with the low fare calendar - Norwegian". Norwegian. Retrieved 10 April 2019. ^ "Ryanair launches new Irish route as airports gear up for St. Patrick's weekend". Independent.ie. 15 March 2019. Retrieved 22 March 2019. ^ a b c d e "Dublin Airport Welcomes Ryanair's Route Expansion". Dublin Airport. 11 October 2018. Retrieved 11 October 2018. ^ a b Murtagh, Peter (26 February 2018). "Ryanair adds nine new routes to winter schedule". The Irish Times. Retrieved 26 February 2018. ^ "Ryanair Announces New Dublin-Kyiv Service". Dublin Airport. 20 November 2018. Retrieved 20 November 2018. ^ "Ryanair launches new Dublin to London Southend route". The Irish Times. 13 June 2018. Retrieved 13 June 2018. ^ a b c d "Ryanair Launches Dublin S18 Schedule – 5 New Routes To Marrakech, Munich, Naples, Paphos & Stuttgart". Ryanair DAC. 29 August 2017. Retrieved 6 September 2017. ^ "Ryanair Launches Irish Winter 19 Schedule 119 Routes, 2 New Routes & 17m Customers P.A." Ryanair. 26 February 2019. Retrieved 26 February 2019. ^ a b "Timetable". Ryanair DAC. Retrieved 27 February 2019. ^ "Ryanair Launches New Dublin To Bodrum Service". DAA. 5 November 2018. Retrieved 5 November 2018. ^ "Ryanair Announces New Dublin To Dalaman Route". Dublin Airport. 15 March 2018. Retrieved 15 March 2018. ^ a b "Ryanair To Launch New Dubrovnik And Split Services". Dublin Airport. 3 December 2018. Retrieved 3 December 2018. ^ "Santiago y Oporto acogerán los vuelos que Ryanair cancela en Vigo" [Santiago and Oporto will welcome the flights that Ryanair cancels in Vigo] (in Spanish). Faro de Vigo. 8 February 2019. Retrieved 8 February 2019. ^ "SunExpress S19 network additions as of 18OCT18". Routesonline. 19 October 2018. Retrieved 5 December 2018. ^ "TAP lança rotas para Telavive, Dublin e Basileia — e há voos para Israel a 120€" [TAP launches routes to Tel Aviv, Dublin and Basel - and there are flights to Israel for € 120] (in Portuguese). NiT. 10 September 2018. Retrieved 10 September 2018. ^ a b c d "Crystal Ski Holidays". Crystal Ski Ireland. Retrieved 3 May 2017. ^ "All airlines flying from Dublin (DUB) to Rovaniemi (RVN)". FlightMapper.net. Retrieved 27 August 2017. ^ "Tunisair S19 new scheduled charter routes". Routesonline. 5 December 2018. Retrieved 5 December 2018. ^ "WestJet outlines 787-9 long-haul and new Calgary – Europe service in S19". RoutesOnline. 10 October 2018. Retrieved 10 October 2018. ^ Partnership, WESTJET, an Alberta. "WestJet to launch seasonal, non-stop service to Dublin from Halifax". www.newswire.ca. Retrieved 10 April 2019. ^ a b "AF 6735 schedule". FlightMapper.net. Retrieved 13 January 2017. ^ "Bluebird Cargo flight BF298". Flightradar24. Retrieved 13 January 2017. ^ "BBD 6810 schedule". FlightMapper.net. Retrieved 13 January 2017. ^ "European Air Transport flight QY2883". Flightradar24. Retrieved 13 January 2017. ^ a b "FedEx flight FX5202". Flightradar24. Retrieved 15 January 2017. ^ a b "Star Air (Denmark) flight S66529". Flightradar24. Retrieved 13 January 2017. ^ "DAA 2011 Annual Report". Archived from the original on 20 March 2016. Retrieved 2 June 2015. ^ "Dublin Airport Authority Annual Report 2012". DAA. 2012. p. 97. Archived from the original on 22 February 2014. ^ "Press Releases > Dublin Airport Passengers Up 6% to 20.2M In 2013". Daa.ie. 13 January 2014. Archived from the original on 1 February 2014. Retrieved 16 February 2014. ^ "Dublin Airport Breaks Annual Passengers Numbers Record". Daa.ie. 4 December 2014. Archived from the original on 7 May 2016. Retrieved 20 January 2016. ^ "Annual Report 2002" (PDF). Aer Rianta cpt. p. 64. Retrieved 25 May 2017. ^ "Annual Report 2006" (PDF). Dublin Airport Authority plc. p. 81. Retrieved 25 May 2017. ^ "Annual Report 2011" (PDF). Dublin Airport Authority plc. p. 77. Retrieved 25 May 2017. ^ "Annual Report 2016" (PDF). daa plc. p. 104. Retrieved 25 May 2017. ^ "Annual Report 2017" (PDF). daa plc. p. 102. Retrieved 26 April 2018. ^ "Passenger Movement by Irish Airport, Direction, Foreign Airport and Month". Central Statistics Office. December 2018. Retrieved 27 March 2019. ^ "Coach and Airport Bus Services To and From Dublin Airport". ^ "Airport Services - Dublin Bus". ^ "Dublin Airport to Dundrum Luas | Dublin Coach". www.dublincoach.ie. Retrieved 23 May 2017. ^ "Dublin Airport - Bus Éireann - View Ireland Bus and Coach Timetables & Buy Tickets". ^ "Timetables". John McGinley Coaches. Retrieved 4 January 2018. ^ "By Rail". DAA. Retrieved 19 January 2016. ^ "Ireland drops €5.6 billion metro projects". Tunneltalk.com. December 2011. ^ "The 'Metro North' is now the MetroLink - here's what it'll look like". The Journal. 22 March 2018. Retrieved 14 April 2018. Wikimedia Commons has media related to Dublin Airport.